An amazing mix of real freeze dried raspberries and freshly roasted and ground almond nut butter blended together with serious white chocolatey chunks. A wonderfully aromatic flavour which is simply irresistible. Suitable for Vegetarians. Made in a factory which handles: cereals (such as oats, wheat and barley); egg (dried egg albumen); products of fish and crustaceans (such as chondroitin sulphate and krill oil). Although no nuts are in the recipe of this product we cannot guarantee that this product or the ingredients used within are free from nuts. This product is a dietry supplement and should be used in conjunction with food as part of a healthy balanced diet not as a substitue for such. This product is not intended for use by persons under the age of 16. This product is not intended to diagnose, cure or prevent any disease. keep out the reach of children. 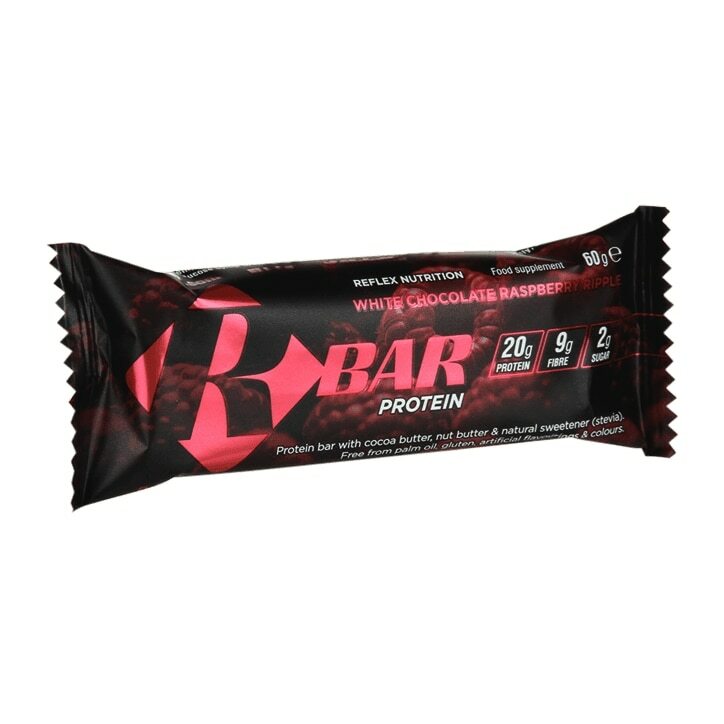 Reflex R-Bar Protein White Chocolate Raspberry Ripple is rated 3.8 out of 5 by 4. Rated 4 out of 5 by Pulloverman from Nice taste Very nice taste and quality it filled the hunger gap until mealtime. Rated 1 out of 5 by Pecan from Great macro's, shame about the flavour and smell! I was really looking forward to trying these bars as I had heard great things about them and this particular flavour sounded delicious. I eat quite a lot of protein bars and am always on the look out for new ones to provide a bit of variety so had high hopes for these. As soon as I opened the bar those high hopes were dashed. The bar had a very strange smell, almost like vinegar! Still I ignored that and tried the bar anyways, to find the taste was even worse than the smell. The bar tasted super sweet and the aftertaste was revolting. Despite stating they contain no artificial sweeteners, colours or preservatives, they weirdly taste very artificial. I managed only one bite before I had to offer the bar to my boyfriend who I'm pretty sure has no taste buds as he can eat anything .. unfortunately even he thought it was awful and threw it in the bin after two bites. This is the only protein bar I've ever not been able to finish eating and I definitely won't be buying these again. Rated 5 out of 5 by skilla from Delicious This bar is absolutely delicious. Just the right sweetness and a lovely consistency. Feels like a real treat but has great macros. Perfect post workout on the go....! Rated 5 out of 5 by Purdie987 from Very Tasty Lovely bar crammed full of white chocolate pieces and freeze dried Raspberry, very satisfying. Love the fact they are made in the UK, will and have bought again and again.